Lovely As A Tree images cut with Sizzlits die from Birds n Blooms, I think. Colored with markers and inks. Autumn Meadows dsp and Buttons Latte. I dry embossed the wood grain paper with the Sizzix Distressed texture plate. All supplies are current SU. I dug out my flower press yesterday and experimented with drying various flowers from around my garden (verbena, geranium buds and something from a tree that has red pods that bloom into a white 5 petal flower.) Yay, free embellishments! You would be amazed at what you can find year round on a nature hike that would be suitable for preserving. Basket was floating around in my stash of odds and ends, I inked it with Creamy Caramel ink. 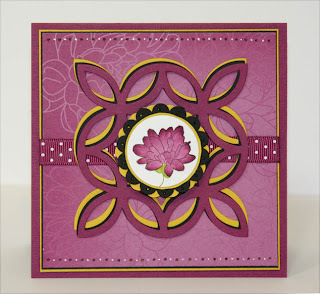 Baroque Motifs swirl in Sage Shadow with flower in Pretty In pink, Going Gray matting and card base. Also for our Doubledog Dare Challenge this week hosted by Beverly (beestamper) for a sketch challenge found in the Splitcoast Challenges thread. Come and join us! Pretty In Pink, sage Shadow, Going Gray, and Whisper White cardstocks. 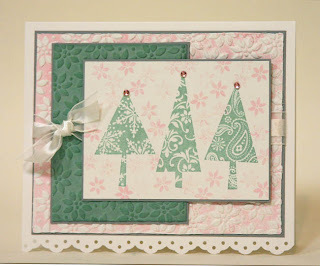 Patterned Pines stamp set, white organza ribbon, and new Holiday mini embossing folder. I inked the embossing folder in pink before running it through the Big Shot to get that additional color. 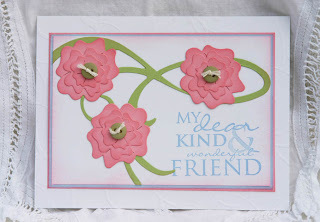 Sizzix die Flowers & Vine #3 in Celery and Pretty In Pink, sentiment from All Holidays in Bashful Blue. Mellow Moss buttons with cream embroidery floss. I used a heavy duty oven bag with lots of texture on it for the foil embossing and the CB Snowflakes folder. 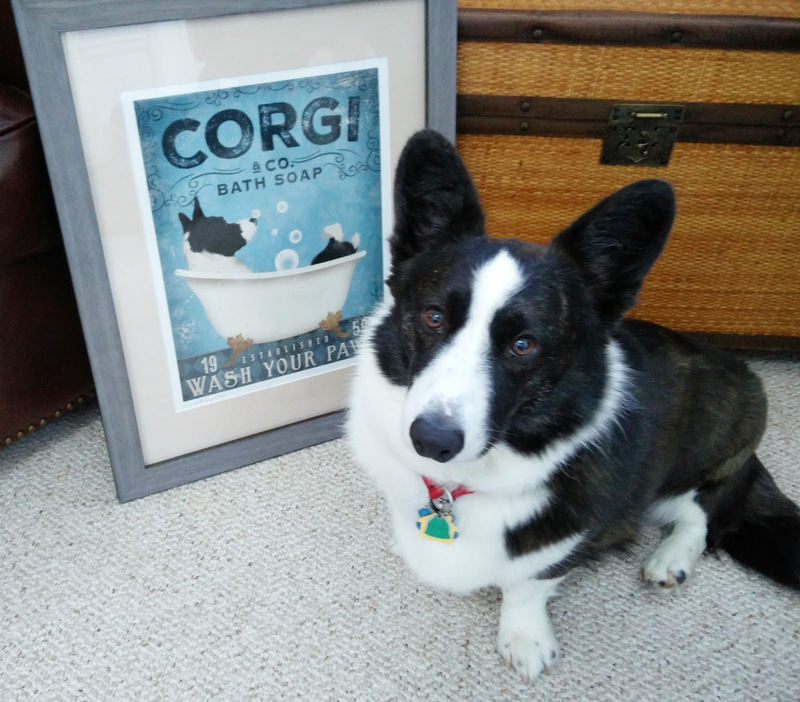 I dabbed on Tempting Turquoise craft ink and wiped off excess. Patterned Pines in turquoise with inked edges. Snow edged with Dazzling Diamonds. 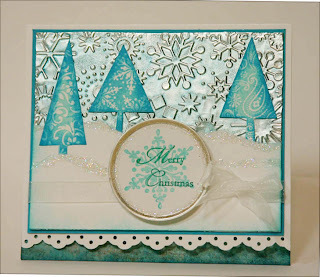 SU large metal tag stamped with snowflake in stamped off once turquoise ink and sentiment stamped in Bermuda Bay. 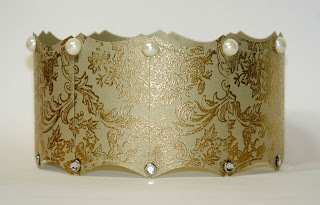 This would be a fantastic Mommy & Me project to let your child decorate her own crown! I cut out 5 of the pillow box and taped them all together with durable Sticky Strip. This looks so much prettier in real life. This is the first time I have tried the chalkboard technique that I can remember and I really like it. Very easy! I stamped the Baroque Motifs swirl twice in Versamark on Basic Black cardstock and chalked it with shimmery chalks in green and then stamped the small flower and chalked in red. You then go over this with a Swiffer dusting cloth and it cleans up all of the chalk except on the stamped image. 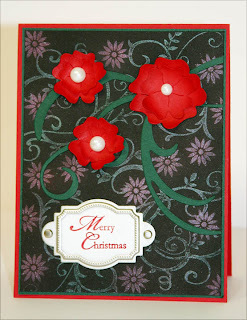 The die cut is Sizzix Flower & Vine, layered the blossoms, curled and inked edges and added pearls. 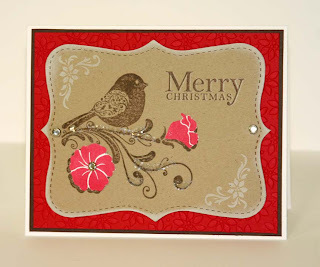 Sentiment is from A Christmas Cardinal, mounted in a Styled Silver hodgepodge hardware frame. 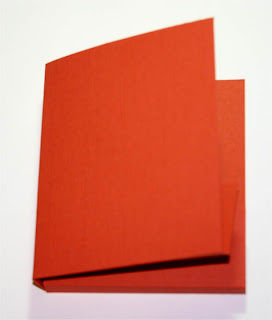 Real Red and Handsome Hunter cardstocks also used in matting. A tri-shutter card made with Whisper White textured cardstock for base with the new Night and Day designer paper from the Holiday Mini. 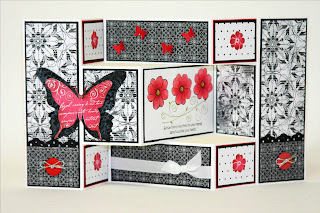 The stamp set is Simple Friendship accented in red for some pop of color. 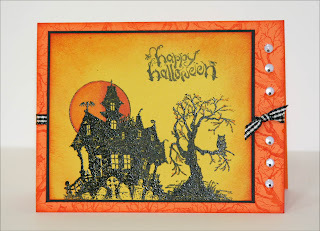 House of Haunts embossed in black on Crushed Curry, Only Orange base that was stamped in matching ink with tree stamp from set. Black gingham ribbon and googly eyes to embellish. Edges were shaded in Apricot and Only Orange. This was made using the very clear and easy tutorial and video featured on Splitcoast yesterday. 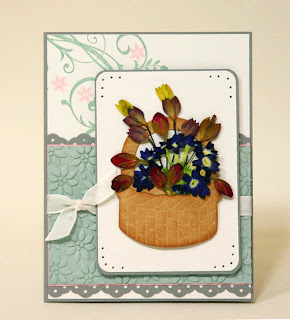 It uses the Sizzix pillow box die (3 of them adhered together) to create a quick basket. 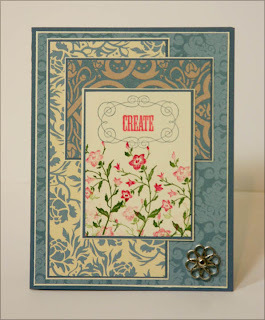 I used the Cottage Wall designer paper on top of Rich Razzleberry cardstock. 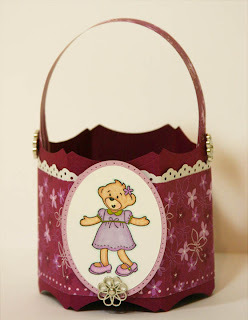 The Build A Bear image was colored in markers and attached with dimensionals and embellished with a filigree brads, I also used these brads to attach handle. I love this new holiday mini set Charming. I stamped it in Regal Rose, Pretty in Pink and Old Olive. Paper is Bella Bleu. 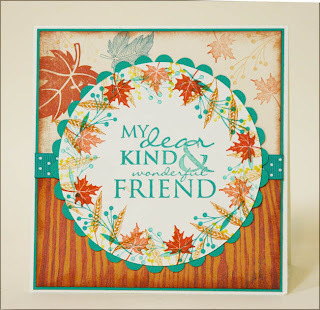 I love the new Autumn Meadows paper with the Autumn Days set. I made the wreath picking up the colors that were in the papers~ Bermuda Bay, Dusty Durango, More Mustard. This pretty flower and paper are from the level 3 hostess set called Flower Lines. I paired this with Crushed Curry and Basic Black for a color challenge. Big Shot Lattice die in those colors along with the Rich Razzleberry frame out the main image. 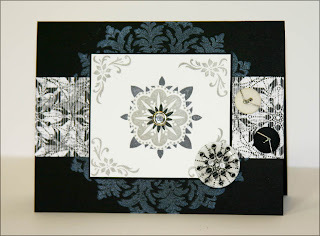 Baroque Motifs set used for main image, Medallion stamped in white on Basic Black. 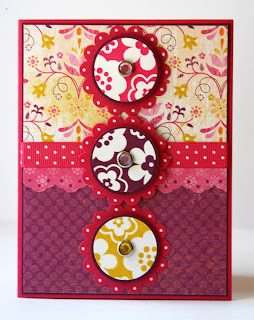 Handmade button (tutorial on SCS today) and designer paper is from the Night and Day designer paper in the Holiday mini. 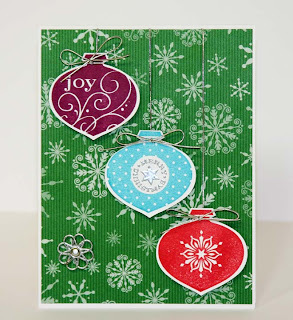 Delightful Decorations set and new ornament punch made for a quick and easy Christmas card today. Silver cording available also in the Holiday Mini. Paper is Merry Moments, filigree brad, and ink colors of Real Red, Rich Razzleberry, Taken With Teal. 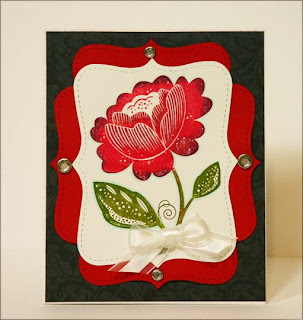 Bella Blossoms stamp inked in Real Red, Razzleberry, Old Olive and Soft Suede. Real Red Top Note and Cast A Spell paper with white organza ribbon and clear rhinestone brads. 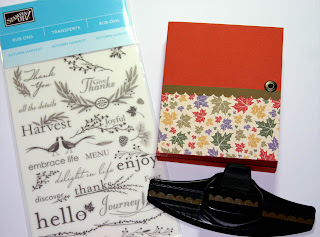 All supplies are current Stampin' Up. Haunting Hill jumbo wheel colored in marker and the sky was shaded with various inks, Cast A Spell designer paper along with black gingham ribbon and clear rhinestone brads. New hostess set from Stampin' Up Patterned Pines tree was stamped in Bermuda Bay and cut out, arranged in a star pattern. 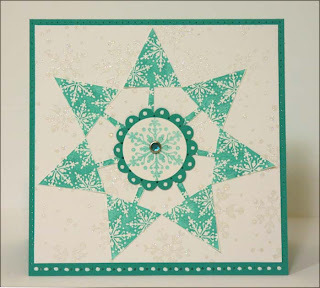 Background on Whisper White is the Bold Snowflakes jumbo wheel embossed in Iridescent Ice powder. All supplies are Stampin' Up. Hostess Level 1 set Patterned Pines snowflake along with A Cardinal Christmas sentiment, Merr Moments designer paper, Pretties Kit stick pin. The wreath was made with the Watercolor Minis and DD Branch sets, retired SU. Sentiment from All Holidays. Colors for today Pretty In Pink, Whisper White, and Soft Suede. What you got in that pic-a-nic basket? 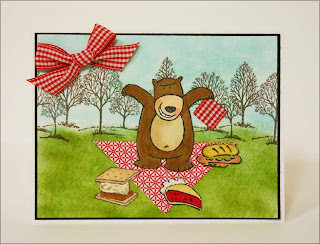 This card was a lot of fun to make and was created for Mothermark's Teapot Party Challenge over at SCS. This is for today's challenge going on over at Splitcoast, they have a link to a tutorial there in case you would like to try this. The hardest part for me was finding my iron since I never use it, for ironing clothes anyway. I used glitter crayons with a little additional Dazzling Diamonds sprinkled in. Shave off crayons onto your cardtsock and then iron between sheets of wax paper. Stamped rose image onto transparency and then adhered to melted crayon piece with a thin layer of Crystal Effects. This was the step where I added a sprinkling of Dazzling Diamonds. Bashful and Ballet Blue cardstocks with Finial Press embossing folder, blue taffeta ribbon, and Fifth Avenue Floral rose. Sentiment is from Teeny Tiny Wishes. 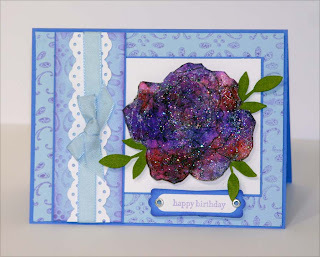 This card was made for today's Featured Stamper, Shannan Teubner. I changed a few things about her card to make this. 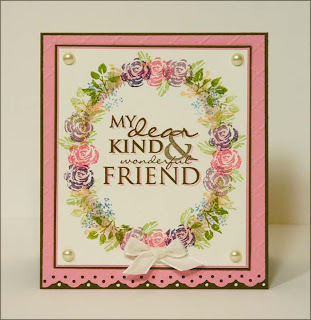 I used Wings Of Friendship stamped in Basic Brown on a Kraft Top Note. 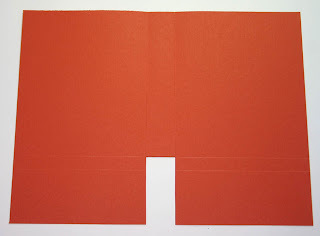 The Real Red panel was embossed with the new Petals A Plenty folder, mounted to Chocolate Chip and then Whisper White. I added some Chunky Sprinkles glitter to branches and some clear rhinestone brads. 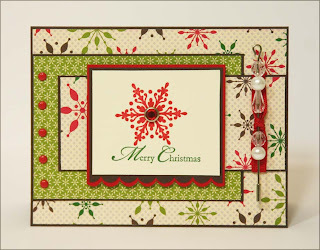 The white corner stamp is from the new hostess level 1 set calledPatterned Pines available for a limited time only in the new Holiday Mini catalog. All supplies are current Stampin' Up. These were inspired by some Halloween dresses from the CDW Kids website for today's SCS Inspiration challenge. This is a clean and simple 5-10 minute card. 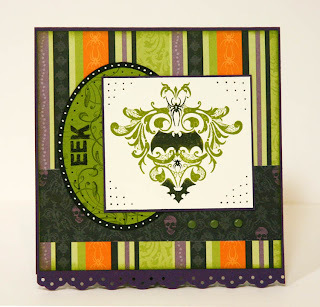 I stamped the Baroque Motifs swirl in Old Olive on Very Vanilla cardstock and sponged edges with Apricot Appeal. 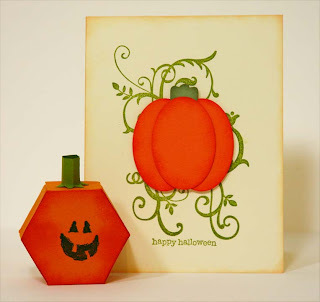 The pumpkin was made with the large oval punch, edges sponged with matching ink, stem is Modern Label punch in Mellow Moss. 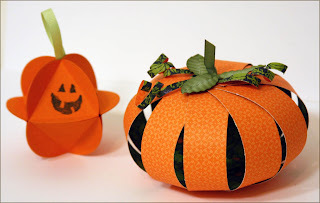 The little pumpkin treat box was made from a template from a Paper Projects book by Sandra Lounsberry Foose. I like to check my library for craft and cardmaking books. If your library doesn't carry it, some will request it for you from other participating branches. Or if they are really nice they will order a copy for you! It never hurts to ask. Time to start those Fall/Halloween projects! 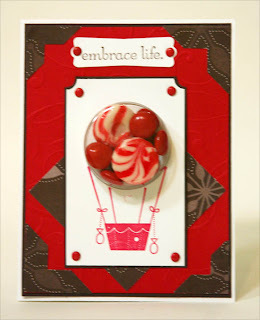 The first card uses the scallop circle dies for the Big Shot and the new Sweet Centers treat cups. I used the jack-o-lantern face from Autumn Harvest with black StazOn ink, a strip of Old Olive cardstock curled, and a little tab of Kraft taffeta ribbon for the stem. Filled with Reese's Pieces. yum. 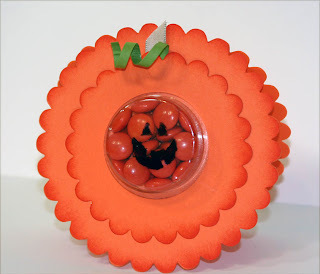 The second picture features a little pumpkin man made with the 3D ornament Big Shot die with a loop of Celery grosgrain ribbon. 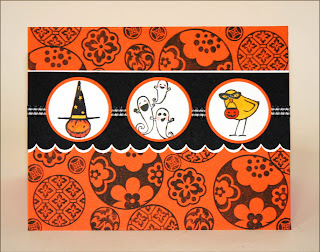 The second sample is a designer paper strip pumpkin. I used the Cast A Spell designer paper with some leaves made from Mellow Moss and matching ribbon. Petals A Plenty Textured Impressions embossed the pink and white panels. 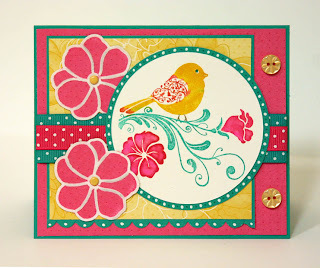 For the piece that was cut with the Top Note die and then chalked with red stampin' pastels to pop up the color. Jackpot designer paper, poinsettia made with 5 petal flower and vintage brass brads, pink taffeta ribbon. I embossed the lines in this flower with a dry embossing stylus. Sentiment made with Teeny Tiny Wishes, Modern Label and Word Window punches. Paper is Cast a Spell and stamp set is From The Crypt. Colors Black, eggplant, and olive. I stamped the flourish from the Wings Of Friendship set in olive on the oval and then stamped the EEK from the Sweet Centers set on the side. Main image was inked in old Olive and then I used a black marker to go over the bat and spiders before stamping. Using a very similar style layout, here are three different cards made with the Circle Circus. Some are ones I made a while back but I wanted to show you how they look together. This is the new set from the SU Holiday Mini called Sweet Centers. I stamped the balloon in Real Red and added Creme Savers and M&M's to the treat cup. 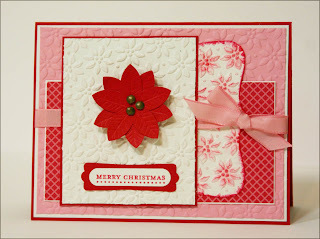 The Red cardstock was embossed with the Flourishes plate and I used the Merry Moments chocolate designer paper. Real Red brads and photo corners as embellishments. Embrace Life sentiment from that named set punched with new Modern Label punch. 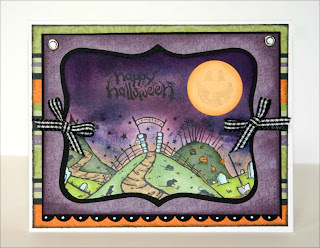 I love this new Halloween set from the Stampin' Up Holiday mini catalog! 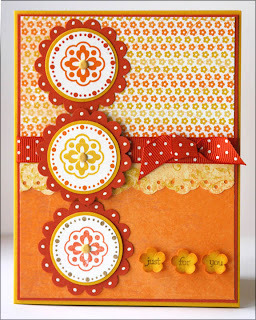 I created my own designer paper by stamping Circle Circus in black on Only Orange. 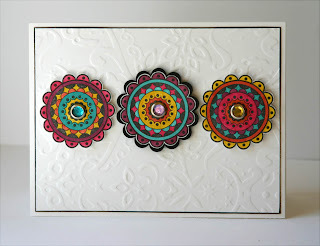 Twick Or Tweet set colored in markers and punched using 1 1/4" and 1 3/8" circle punches. Black gingham ribbon also used. 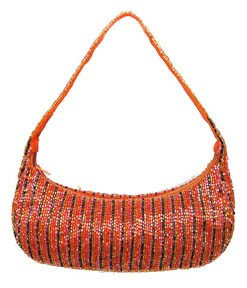 Handbag by Moyna. 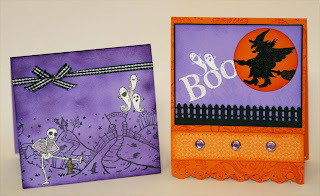 All supplies are current Stampin' Up, a mixture of Halloween sets and paper for these scraplings. They measure 4 1/4 x 1 1/4. 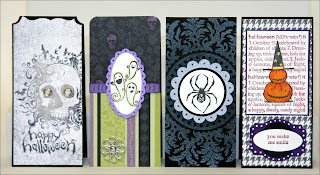 From The Crypt, Twick or Tweet, Eat, Drink, and Be Scary along with Night & Day and Cast A Spell designer papers. Also used Medallion in craft white and various punches. This makes a great gift, fill with thank you cards and envelopes. Cut cardstock 8 1/2" x 11. Score at almost 5" on both sides of 11" side. On shorter side score at 6" and 6 1/2". Cut tab in center to second fold line and adhere to inner spine. Fold into a book like card holder. Decorate as desired. 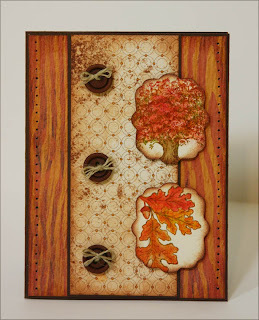 I used Autumn Traditions designer paper (3" x 5" for bottom front) and Autumn Harvest rub-ons with a jumbo eyelets on front and back. The length of polka dot Dusty Durango ribbon was 19" and fed through the brads and tied closed in a bow. I will fill this with thank you cards and envelopes for a gift. All supplies are current Stampin' Up. This week our Doubledog Dare challenge was to make a fall or back to school card that had an apple or apples somewhere on it. You are very welcome to join us, there are no fancy requirements, just post your creation using the keyword DDC on SCS so we can find and comment on your card. 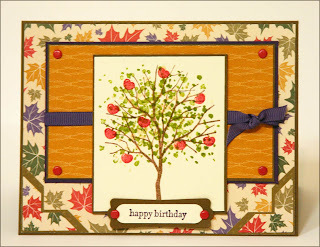 I used the Branch Out Tree and the cherry from On A Pedestal for my apple for this fall card. Autumn Traditions paper, eggplant grosgrain ribbon, and Earth Elements brads also used. The new In Colors of Bermuda Bay, Melon Mambo, and Crushed Curry were today's featured colors. I used the new level 2 hostess set Wings Of Friendship, some Buttons Latte, polka dot ribbons. The Embosslits Simple Flower was cut using the Lovely Flowers (level 3 hostess) paper and then sanded with a sanding block to bring up the white.